Software Development is a core competency for Revell Research Systems. We advise clients in both business and technical terms about developing systems. We train and support other developers and we build traditional applications and web sites for our clients. We believe that top-end web site development is slowly merging with traditional application development. The most useful and most visited web sites tend to be database driven and firmly place functionality over ascetics (although we believe web sites should still be well-designed graphically). We normally develop applications either for the Microsoft .NET Framework (using either VB.NET or C#) or in Microsoft Access. Our applications generally have the same 'look and feel' as Microsoft products. Our applications target either traditional PCs or hand-held Pocket PCs (PDAs). We develop Internet or Intranet web sites using a range of tools such as HTML, XML and ASP.NET. Our sites are characterised by their ease of navigation, their reliance on traditional programming skills and on the careful crafting of their content. We have considerable skills at each stage of the systems development life cycle. We have the strong people skills necessary to investigate and analyse business requirements. We have the necessary technical insight to pull together good designs. We have years of experience in building small and medium size projects that target 100s of users. Our developers are well-educated and trained in traditional methodologies such as SSADM 4.3, although most of our projects are developed using more modern approaches. We are technical evangelists for the Microsoft .NET Framework, specialising in the C# and VB.NET programming. We passionately believe in object-oriented development, which we have been advocates of since the late 1980s. We have strong database development skills in both Microsoft Access and SQL Server and are well-versed in Transact-SQL. We can provide business and technical advice on software development issues; we can train, educate and mentor your developers; we can provide specialist support; or we can execute your entire project. Do you need advice on how to proceed with a development project? We can conduct a formal feasibility study to help you assess the risks and benefits. We can give you informal advice about the advantages and pitfalls you will face. Do you need advice on technical architecture? or on systems analysis and design? You can benefit from our experience in architecting solutions and our considerable knowledge in systems analysis and design. Do your software developers need training or mentoring? We can help your developers become more productive more quickly by drawing on our deep training and mentoring skills. Do your developers need specialist help in some areas? We can assist your developers in areas where they lack expertise, with our staff working alongside your own. Do you need someone to build your application or web site? If you do not have any in-house development expertise, we can supply it so you can compete on an even keel with bigger competitors. We develop a range of applications and web sites each year. Our clients range in size from the small to the very large. We have chosen the four examples below to show the diversity and scale of our work. A web site promoting an importer of high quality Mediterranean foods. The site is crisp and easy to navigate without any unnecessary clutter. 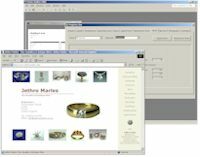 A successful web site that promotes the work of a well-known specialist in fine jewellery and antiques. The site was designed to highlight previous work and encourage people to make contact. We developed an extensive estate auditing tool for our clients, a national chartered surveying practice. The tool is used widely across the country and has been used to survey an estimated £1bn of property. A tool to assist the sales staff of one of Europe's largest wine, spirit and drinks merchants (with a turnover of £500M) to sell more wine. The software is currently in the closing stages of development.